NEW YORK, Sept. 19 — M-G-M Records is prepping a new series of albums based on the ABC radio network show “Piano Playhouse.” New series will be issued under the title “Pianorama” and will be available as two-pocket EP, a single 10-inch LP or four record 78 r.p.m. packages. 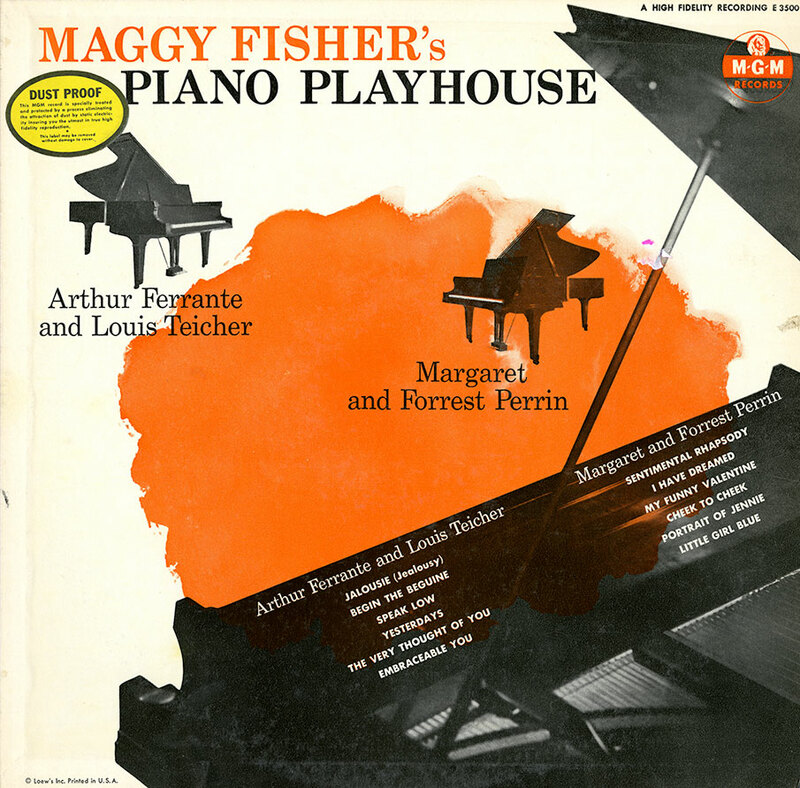 “Piano Playhouse” is produced by Maggie Fisher. The diskery has been releasing similar material in the past under the “Piano Playhouse” title. First disk in the new series will feature two-piano team, Ferrante and Teicher. The disk will be heavily promoted for the upcoming “Piano Playhouse” tour which starts early in October. Once again music featured on Piano Playhouse, one of the most popular musical programs on the air, is made available by MGM Records to its millions of devoted fans. Since Piano Playhouse has as its stars the greatest keyboard artists in the world, it is little wonder that the brilliant piano duo of Arthur Ferrante and Louis Teicher was chosen to represent the epitome of fine duo pianism. Ferrante and Teicher’s playing is dynamic but full of charming nuances, with classical overtones. They are indeed a rarity amongst keyboard artists, for they are the only piano team in the world who can play both jazz and the classics with equal skill. Music critics have praised their classical playing extravagantly, while jazzophiles point with equal pride to their terrific beat. Most recently they have rocked the music world with their experiments in dynamic new sounds, made by two pianos alone, but suggestive of full orchestra. Ferrante and Teicher have been friends since their earyl music school days. Both were on the faculty of New York’s famed Juilliard School, and have appeared in leading nightclubs and hotels throughout this country and Europe. Most recently their concert tours have been sold out to standing room only. Their exciting recordings, plus their weekly appearances on Piano Playhouse has indeed brought them world wide fame. The delicacy of this poignant, sentimental music is beautifully captured in this romantic two-piano arrangement. The exciting beguine tempos are augmented with lush harmonies reminiscent of Debussy. One of the most exciting arrangements ever recorded. Tiger Rag tears along at breakneck pace, still managing to sound effervescent despite its persistent jazz beat. All the flavor of Latin American music is captured in this exciting tango. Here the twin keyboards manage not only to speak low, but to speak beautifully as the rich tone of the pianos sing out the melody line. One of the most beautiful of modern melodies, this theme, which has been so much a part of our program, was written especially for the show by Mario Braggiotti. Lyrics were recently added, and the result is a hauntingly beautiful melody, played by Ferrante and Teicher. Once again a nostalgic melody is played with touching tenderness. Here the versatility of this sensational duo is demonstrated beautifully by this Gershwin favorite which begins with a sweeping rubato feeling and develops into a modern arrangement with a touch of the blues thrown in for good measure. This album indeed contains a Pianorama of keyboard music ranging from the wild jazz of Tiger Rag to the Debussy-like approach to Begin The Beguine. Whatever your choice, we hope you’ll enjoy this special album of Piano Playhouse music played by the exciting and versatile team of Ferrante and Teicher. “maggy fisher’s piano playhouse”—and two piano magic! The world-renowned pianistic playhouse and the showcasing of two pairs of great duo-pianists! Piano wizardry abounds here—as Arthur Ferrante and Louis Teicher and then Margaret and Forrest Perrin present a collection of unforgettable show tunes and popular standards. Here are two of the country’s finest two-piano teams outdoing themselves on great music! The arrangements are fresh, fascinating, and phenomenally virtuosic. Fingers fly and music sings from big concert grand pianos in one of the most glorious feats of music “maggy fisher’s piano playhouse” has ever set before you! Here, Arthur Ferrante and Louis Teicher offer Jacob Gade’s sultry tango jalousie (Jealousy) and Cole Porter’s immortal begin the beguine. They breeze through the haunting cadences of Kurt Weill and Ogden Nash’s evergreen speak low and Jerome Kern and Otto Harbach’s yesterdays. And, their fingers caress Ray Noble’s the very thought of you and George and Ira Gerswin’s embraceable you. Here, Margaret and Forrest Perrin serve up in regal pianist fashion Alfred Newman and Harold Adamson’s sentimental rhapsody and Rodgers and Hammerstein’s i have dreamed. You’ll find here treasurable versions of Rodgers and Hart’s my funny valentine and Irving Berlin’s cheek to cheek. There’s the lush and languorous portrait of jennie by J. Russel Robinson and George Burge and Rodgers and Hart’s little girl blue. A great listening experience awaits you here—piano music at its best! The music comes your way from “maggy fisher’s piano playhouse”—your guarantee of listening pleasure! This album originally issued as a 10" Lp featuring 8 tracks (pictured here). It was reissued as a 12" Lp (pictured above) featuring just 6 tracks by Ferrante & Teicher on side one and 6 tracks by Margaret and Forrest Perrin on side two. The sequence of F&T tracks on the 12" Lp: Jalousie (Jealousy), Begin The Beguine, Speak Low, Yesterdays, The Very Thought Of You and Embraceable You. By the way, some of F&T's "Piano Playhouse" radio shows are available for sale on CD-R.